The recent IMF report on Iran’s economy has ruffled feathers in the West by presenting a positive assessment of the economic reforms undertaken by the Iranian government and drawing an optimistic outlook of Iran’s economic growth. The IMF has particularly lauded Iran’s much-fretted subsidy reform, which removed around 100 billion dollars’ worth of mainly energy subsidies late last year, noting “The subsidy reform is expected to increase efficiency and competitiveness of the economy, improve income distribution, reduce poverty, and help Iran unlock its full growth potential”. The report also highlights that “cash transfers, financed out of the revenues arising from the energy price increases, were instrumental in supporting domestic demand, improving income distribution, and reducing poverty”. It is not the first time that the IMF has presented a moderately positive assessment of Iran’s economic outlook. In previous years, the IMF also positively evaluated structural economic reforms undertaken by the Iranian government in the form of privatization, reducing the role of the government in economic activities and liberalizing the prices of energy and agricultural products. However, the latest IMF report on Iran’s economy has received wide negative reactions from different quarters in the West. Some mainstream American media lambasted the IMF assessment of Iran’s economy for ignoring what they consider to be “the dire reality of Iran’s economy, weighed down by strict international sanctions, mismanagement and inefficiencies”. While some of these negative characterizations of Iran’s economy are no doubt warranted, as Iran’s economy still suffers from a host of structural problems and lack of political consensus among the elites on certain economic goals and policies, they do not represent the whole reality about Iran’s economy. It can hardly be disputed that Iran has daringly undertaken major economic reforms over the past several years which have the potential to give enormous boost to Iran’s economy in the longer run. These reforms, albeit undertaken out of necessity rather than a principled commitment to market economy principles, have already provided positive stimulus to Iran’s economy and are expected to add more efficiency to it in the longer run. Massive privatization of state-owned enterprises over the past several years, which had hitherto justified the state sponsorship of major economic activities, have been the hallmark of economic reforms in Iran, which was enabled after the reinterpretation of the relevant provisions of Iran’s constitution and following authorization by the highest political decision-making bodies in Iran. 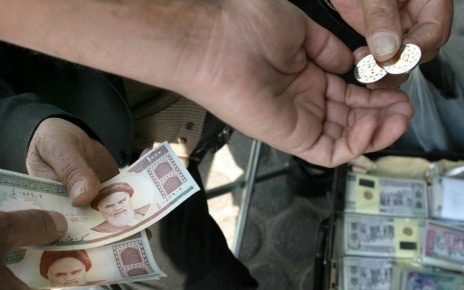 According to the Iran Privatization Organization, over the past five years 589 state-owned companies with nearly 83 billion dollars’ worth of shares have been privatized. Although the process of privatization in Iran has been influenced by factors other than growth and efficiency considerations, such as redistributive justice, and, as the IMF also recognized in 2008, due to “the lack of large private investors, many government-owned entities have been acquired through non-cash or deferred settlements by quasi-public sector institutions”, some of the privatized companies, mainly those in the telecommunication sector, have already recorded positive growth following their privatization. Iran’s non-oil sector has also increasingly been contributing to the country’s economic growth in recent years. Although Iran’s vast, yet still largely protected, domestic market has historically acted as a disincentive for the expansion of non-oil exports, the privatization of state-owned companies, especially those in the energy and manufactures sectors, seem to have accounted for a boost to Iran’s non-oil exports in recent years. Given that petrochemical products have come to comprise the lion’s share of Iran’s non-oil exports, it seems plausible to attribute the surge in Iran’s non-oil exports in part to the privatization of state-owned enterprises in recent years. 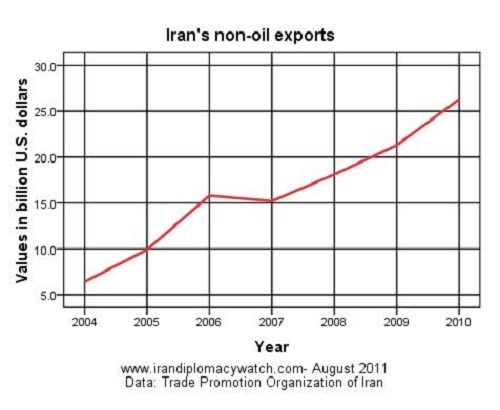 As illustrated in the following chart, in a steady sharp rise over the past six years, Iran’s non-oil exports have more than quadrupled, increasing from 6.4 billion dollars in 2004 to 26.3 billion dollars by the end of 2010. Even though oil exports still account for the large bulk of Iran’s foreign exchange revenues in light of high oil prices in recent years, the share of non-oil products in Iran’s total exports has steadily been increasing over the past several years to the point that it now accounts for close to 30 percent of Iran’s total exports. Privatization and other economic reforms also seem to have played a role in improving Iran’s chance for attracting foreign direct investment (FDI). Despite a drastic fall in the world’s total FDI inflow in recent years, UNCTAD’s World Investment Reports show that the total FDI inflow to Iran has increased nearly 13 fold over the past six years. 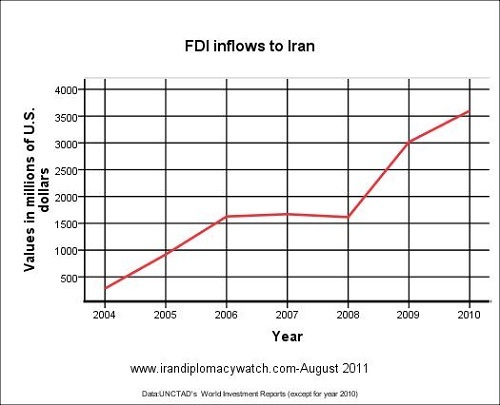 As illustrated in the chart below, after two years of no growth in attracting FDI, FDI inflow to Iran has sharply risen again since 2008, thus registering a growth rate of 86 percent in 2009 and a 20-percent growth rate in 2010. While the volume of FDI inflows to Iran is still modest as compared to the volume of FDI inflow to some other developing countries, including some of Iran’s regional competitors such as Saudi Arabia and Turkey, it clearly demonstrates Iran’s improved capacity to attract foreign direct investment. Notwithstanding the above points, Iran still has a long way to go to reduce its dependence on oil exports and create the necessary conditions for a sustainable economic growth. The current political conflict between Iran and the West over Iran’s nuclear program has driven both sides to highlight certain aspects of Iran’s economic realities at the expense of its other aspects for political purposes. Iranian officials understandably tend to portray Western sanctions against Iran as a blessing in disguise and are thus ironically publicly thankful to the United States and its Western allies for imposing sanctions on it for they have prompted it to implement some of the much-fretted economic reforms. While this narrative has significant elements of truth to it, it ignores the high costs of ongoing adjustments on the Iranian economy resulting from the expanded Western sanctions. The fact that Iran’s supreme leader has named the current Iranian year as ‘the year of economic Jihad’, calling for economic discipline and a more efficient management of Iran’s economy also indicates at least the less than full satisfaction of Iran’s top political leaders with the current status of Iran’s economy and their anticipation of more economic challenges ahead. On the other hand, the proponents of the current Western confrontational strategy towards Iran also tend to exaggerate the impact of sanctions on Iran’s economy by portraying a gloomy picture of Iran’s economic realities and ignoring its various positive elements. This position makes sense in light of the fact that recognizing the ineffectiveness of sanctions against Iran would mean that all the previous U.S. lobbying efforts with many countries around the world with the aim of intensifying sanctions against Iran have gone to waste and have borne no fruits. The policy implications of such an assessment in the form of legitimizing either reconciliation and political compromise with Iran or riskier and more confrontational approaches towards it, which entail high political risks for the U.S. administration, also provide further incentives for projecting a distorted picture of Iran’s economic realities in the West. What seems to be lost in the midst of this conflict is the fact that developing a sound and realistic strategy towards Iran requires that the reality be seen and projected in its entirety rather than in selective and partial manners by all concerned.